The Salesians of St. John Bosco (or the Salesian Society) originally known as is a Roman Catholic religious institute founded in the late nineteenth century by Saint John Bosco in order to, through works of charity, to care for the young and poor children of the industrial revolution. The Salesians' charter describes the society's mission as "the Christian perfection of its associates obtained by the exercise of spiritual and corporal works of charity towards the young, especially the poor, and the education of boys to the priesthood." 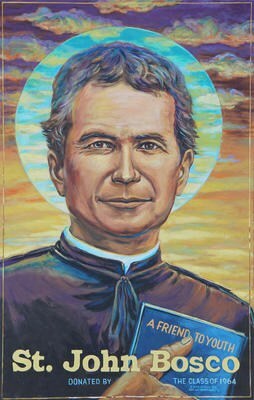 Don Bosco was inspired create a vast movement of persons to bring the Gospel of Jesus to young people and to work for the benefit of the young. He founded the Society of St. Francis de Sales (Salesians of Don Bosco), the Institute of the Daughters of Mary Help of Christians (Salesian Sisters), the Association of Salesian Cooperators, and the Association Devoted to Mary Help (ADMA). Other Salesian Family Groups have formed and today there are 28 Groups. The Salesian Family Groups have spread throughout the world and number 402,500 members. These Groups live in communion with each other, share the same spirit and, with specifically distinct vocations, continue the mission Don Bosco began. His Salesian charisma continues to inspire people serve young people especially those who are poor and at risk. Da mihi animas, catera tolle... "Give me souls, take away the rest" was the motto of Don Bosco when describing his work with the young. The Salesian gift to the Church is its unswerving focus on the betterment of each young person through the education of the whole person. Salesian High School continues the work of Don Bosco seeking to educate the young in Boyle Heights. Therefore an education at Salesian High School has as its primary focus the building of a Christian family that has as its ultimate aim the education of the young in order for them "to become good citizens of this world and the next." It is through a Salesian style of reason, religion, and loving kindness that the school builds community and enables that community to educate the young. By reason, we mean an awareness of the concerns and preoccupations of the young through a process of dialogue promoting a sense of equality and mutual growth. By religion, we mean our personal relationships with God that keeps us mindful of relationships with others. By loving kindness, we mean lovingness to a degree where the young know they are loved. As an educative community, Salesian High School strives to focus its attention and efforts on preparing the young to be actively involved in the Church and society by means of their contributions as leaders, brothers, and ministers. Our academic courses supply our boys with the knowledge necessary to integrate their faith and culture. An underlying thrust of Salesian High School is to assist each young person to a higher awareness of self by educating the whole person: the mind, body, and spirit.